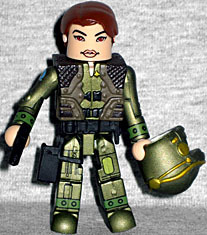 When Series 2 of the Battlestar Galactica Minimates came out (on August 22, 2007), it took a cue from Series 1 by including a Cylon figure that had already been available twice before. This is the "Cannon Centurion Cylon," which means he has the usual Minimate body and all the various Cylon add-ons - feet, waist, torso and head cap - plus new hands that have the fingers retracted to create, well, cannons! What did you expect from the Cannon Centurion? Lollipops? For a full review of him (and all the other Cylons) see here. It's a good-looking figure, and even if you already bought it the two previous times it was released, aren't the Cylons a perfect choice for army-building? Lieutenant Boomer is secretly a Cylon - 8-year-old-spoiler warning! She's a sleeper agent, though, so she didn't know she was a Cylon (unlike the other major copy of her on the show, "Athena," who knew herself to be a Cylon the whole time). On the original show the character named Boomer was a black man, not a Korean woman, but who cares about that? She has the same body as Starbuck (which is funny, since Grace Park was one of the two finalists for the role of Kara Thrace - obviously, she lost out to Katee Sackhoff) and Apollo, because Art Asylum had to get the most out of this complicated Viper Pilot uniform mold. She's got the same pistol, holster and flight helmet that is just a little bit too tight on her head. The brown ponytail is a new piece, for when you don't want her helmet on. I actually ended up getting two of these. . . not for the army building (that was a bonus) but so I could steal Boomer's hair for Astonishing X-Men Kitty Pryde. The Phoenix hair she shipped with was all wrong.